St. Augustine grass is popular in the tropical and subtropical regions of the southern United States. It covers the ground well with a thick, short, dark blue-green grass. Standard and semi-dwarf varieties are available. St. Augustine grass grows slowly, making it easier to maintain with fewer mowings. Laying sod is the most expensive way to establish St Augustine grass but also the fastest and most reliable method. Preparing the ground before laying the sod and watering well after placement will help. Measure your yard, and determine how much sod to order. Then orrder 10 percent more sod than you expect to need. Cut sod to fit around trees and other objects, creating some waste. Plan to have help available to lay the sod when it arrives. Lay the sod on the ground within 24 hours for best results. Loosen the top few inches of soil. Remove old grass or weeds and large rocks. Level the soil to create a gentle slope away from the house if possible. Spread 1 to 2 lbs. of general fertilizer per 1,000 square feet, and rake it into the top inch or two of soil. Use a roller to firm the soil if needed. Thoroughly water the soil a day or two before laying the sod. The soil should be moist but not muddy. Arrange for the sod to be delivered in the early morning if possible. If the weather is hot or the soil has dried out, give the soil a light sprinkling of water to moisten and cool the soil. Place the sod delivery in a central spot, or spread the pallets around the yard. This will save you time and energy in the end. Begin laying the sod as soon as possible after delivery. 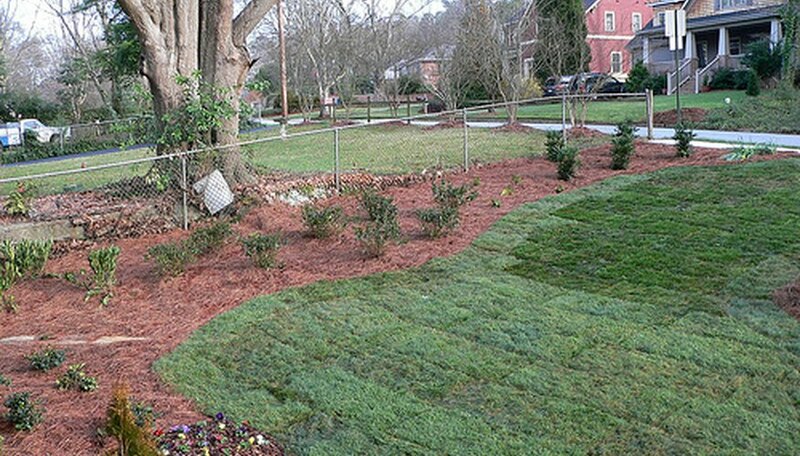 Lay the sod along a straight edge, such as a driveway or property line in a staggered brick-like pattern. Place each piece tightly against the previous piece so that seams are close together and barely noticeable. Rotate each piece to create a brick-like pattern to avoid a long, straight seam. Avoid walking, standing or kneeling on the newly laid sod. Continue laying sod, trimming pieces to fit closely around trees or curves in the landscaping until the entire lawn is covered. Go over the sod lightly with a roller to smooth the surface. Water the grass as soon as the sod is down. If you are covering a large area, water each section as it is finished. Immediate water will help the grass survive the transplanting. Continue watering twice a day for the first two weeks. If the weather is hot and dry, water more frequently for the first few days. At the end of two weeks, slowly reduce the watering, spreading it out slowly until you are watering only as needed. (Some cities have watering restrictions, so check the laws in your area.) Water established grass only as needed. Allow the grass to wilt slightly before watering. This will encourage the roots to grow deeply and help the plants resist pests and disease. Apply a fungicide during the hot humid summer months to prevent blight and fungus. Young St. Augustine grass is very sensitive to blight and fungus when the weather is wet or humid. After three years, the grass will be well established and not as susceptible to disease.